FC Barcelona came from behind to salvage a 1-1 draw against bitter enemy Real Madrid at the Camp Nou in the first leg of the Copa del Rey Semi-Finals clash. Lucas Vázquez gave Madrid an early lead after scoring in the 5th minute against the Blaugrana that had Messi on the bench. Barça though would grab the equalizer in the 57th minute through Malcom’s beautiful strike to make it 101. Messi entered the game in the 63rd minute but his presence wasn’t enough to help the team grab a game winner due in large to Madrid’s plan to subdue him. Barça will have to overcome Madrid’s away goal advantage when both sides meet in Madrid on February 27 for the second leg to decide who goes to the Copa del Rey Final. Barça now have to shift their attention to this Sunday’s league fixture when they travel to Basque country to face Athletic. FC Barcelona: Ter Stegen; Semedo, Piqué, Lenglet, Jordi Alba, Busquets (c), Rakitic (Arturo Vidal, min. 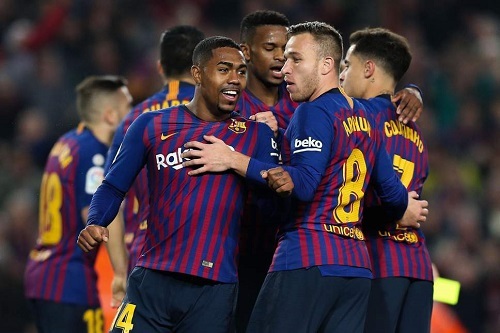 62), Arthur, Malcom (Aleñá, min. 75), Coutinho (Messi, min. 63) & Luis Suárez. Real Madrid: Navas; Carvajal, Varane, Sergio Ramos (c), Marcelo, Llorente (Casemiro, min. 63), Kroos, Modric, Lucas Vázquez (Marco Asensio, min. 84), Vinicius Junior (Bale, min. 63) y Benzema. Goals: 0-1, Lucas Vázquez (min. 5); 1-1, Malcom (min. 57). Cautions: Sergio Ramos (min. 9), Semedo (min. 43), Luis Suárez (min. 55), Marcelo (min. 56), Jordi Alba (min. 57) & Arturo Vidal (min. 88). Previous PostMessi inspires Barça to a 2-2 comeback draw against Valencia. Next PostBarça held scoreless in a disappointing draw at Athletic.